Earn up to 1,415 reward points. Get organized with this spacious and useful table. The LP760A Percussion Table is the ideal percussionist's work station for live and studio performances. 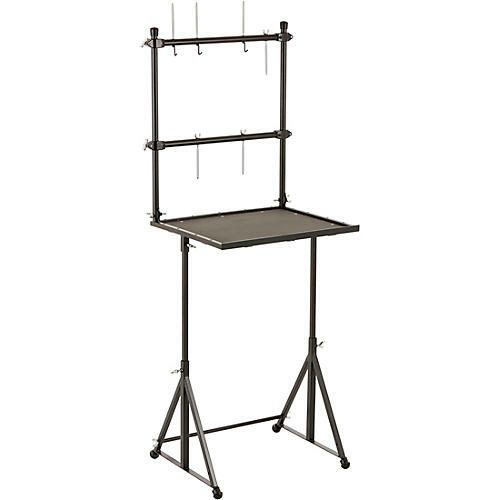 This versatile table can hold dozens of percussion instruments within easy reach of the performer. 2 height adjustable tiered crossbars provide up to 24 possible mounting locations for use with 3/8" diameter mounting rods. 6 rods and 3 triangle hooks are included with each table. The rubber padded playing surface protects the instruments, and makes for quiet handling. The raised back edge of the table keeps instruments from rolling off. The LP Percussion Table is collapsible for easy set up and portability. When disassembled, the unit measures 26"W x 20"H x 3"D and fits neatly into its nylon carry bag. Keeps your percussion instruments organized and always within reach.